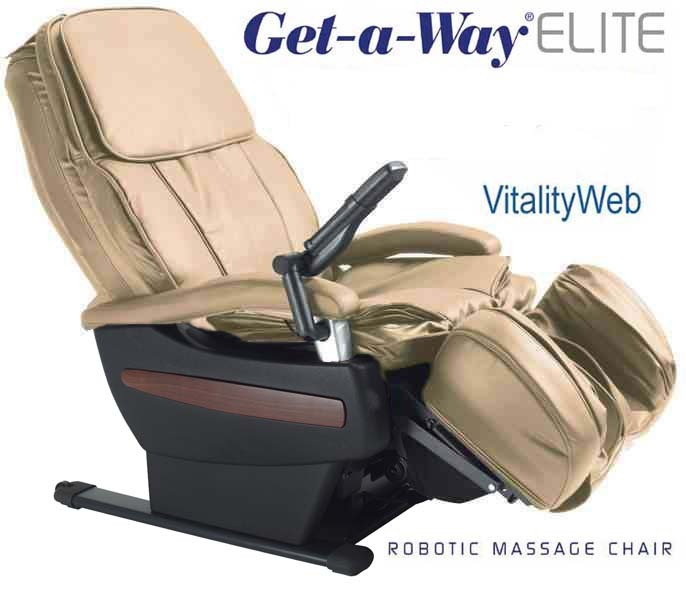 NEW GET-A-WAY ELITE RMS-10 Robotic Massage Chair. GETAWAY ELITE RMS-10 Robotic Massage Chair - The Latest massage chair from the leader in the industry. This chair was specifically designed for those who want the best, no-expense-spared massage chair, with style and design, the Getaway Chair delivers. Using automatic detection of acupressure points and the most advanced massage system in the world, this is the ultimate in indulgence and luxury. The Getaway® massage chairs reduce stress, relieve cervical and dorsal pain, help with insomnia, relax the dorsal muscles, stimulate blood circulation and eliminate tensions throughout the body... all while remaining seated? Yes, it's possible! Introducing the first revolutionary advanced Robotic Massage® Chair using “Automatic Optical Sensors” to detect and target acupressure points along the spine. This revolutionary system emulates the latest techniques used by massage and chiropractic professionals for back and spinal care. Each articulated massage program is customized to your individual contoured shape providing the “ultimate personal massage.” Combines powerful therapeutic rolling pressure with precisely balanced air pressure to invigorate stiff joints and muscles, improves circulation and helps bring vital nutrients to the spinal area, lower back and legs thus melting away soreness and tension. Various Massage Courses/programs: Automatic programs included neck & shoulder, upper back, mid back and lower back soothe away a variety of aches and pains. Automatic detection of massaging points. Multiple combinations of kneading, rolling, tapping, percussion, compression and vibrating provides over a hundred personalized massage combinations. Remote control with built in liquid crystal display provides easy to read comprehensive information to help operate the chair. Adjustable foot rest helps position the massage on specific areas of the calves and feet promoting better blood circulation….just sit back, relax and enjoy your massage! Simply the Best - The most advanced robotic massage chair system available. Optical Body Scan Sensors - Automatic detection of acupressure points. Air Pressure - Balanced Air Pressure to invigorate stiff joints. Programs - Five Healthcare programs, Three Well-Being programs. Various Massage Courses/programs - 5 Health Programs and 3 Well-being Programs. Automatic programs included neck & shoulder, upper back, mid back and lower back. Automatic detection of massaging points. Multiple combinations of kneading (6 speeds), rolling(1 speed), tapping(percussion 4 speeds), compression and vibrating provides over a hundred personalized massage combinations. Remote control with built in liquid crystal display. Back and seat vibration provides a soothing sensation to enhance relaxation. Equipped with a pneumatic device for raising/lowering the footrest for customized height adjustment. Adjustable foot rest helps position the massage on specific areas of the calves and feet. Auto power seat reclines to any position between 120 and 170 degrees (full layout). 23" massage stroke distance. 6" partial massage stroke option. Seat Width (between arms) is approximately 21.5"
Four Motors. 2 in backrest for massage. 1 for recline. 1 for calf massager. Elegant display stand to house the remote control. Equipped with automatic timer function for safety. FREE STANDARD CURBSIDE DELIVERY IN THE CONTINENTAL USA (NEW Chairs). FREE WHITE GLOVE DELIVERY, SETUP and BOX REMOVAL on NEW Chairs in San Diego. SALES TAX INCLUDED on NEW RMS-10 Massage Chairs! "I want to let you all know how wonderful of a massage chair you all have. The Getaway RMS-10 Elite is. Once I sat into the chair, I thought that It was no different from the other chairs. I sat into it and turned it on and it started to massage. I thought that I would never get out of the chair. THat is one wonderful chair." - Jason W.
*WARRANTY INFORMATION: New RMS-10 ELITE massage chairs have a three year structural warranty. New RMS-10 Elite massage chairs come with a manufacturer's one-year limited warranty against mechanical defects (cosmetics are not covered). Parts are covered for one year from the original date of purchase with Parts and Labor are covered for 30 days from the date of purchase on New Chairs. Refurbished Massage Chairs have a 90 day limited warranty for parts. The warranty is not valid if the product has been misused or damaged in any way that is beyond the control of the manufacturer. The chair (or parts) may need to be returned to the manufacturer for service by technicians. Chairs are packed for shipping and require minor assembly. Extended warranties are available on New Massage Chairs. More Warranty Information.